Rwanda Defence Force (RDF) this week hosted military planners from 16 countries ahead of Exercise Shared Accord 19 due to take place in Rwanda from 14 to 29 August this year. Shared Accord is an annual, combined, joint military exercise that brings together US Forces and other partner nations to foster security cooperation while improving operational planning and mission command capabilities with a focus on peacekeeping operations. This year’s exercise will consist of a Command Post Exercise (CPX), field training Exercise (FTX), and medical readiness (MEDRETE) exercise, all centered on the United Nations Multidimensional Integrated Stabilisation Mission in the Central African Republic (MINUSCA). Brig Gen John Baptist Ngiruwonsanga, the exercise co-director noted the importance of such an exercise not only to the RDF, but also to other African military partner nations. “RDF looks at it as a huge opportunity to learn from each other. Different military partners share experience and learn together. Rwanda is of course, delighted to host the exercise for the second time and a lot is expected from it,” said Brig Gen Ngiruwonsanga. Col Brian Elliott of the US Army Africa (USARAF) rates the exercise as extremely important to partner nations that contribute to peacekeeping operations and United Nations mission. “United States Army Africa is committed to working with all African partners to improve in peacekeeping operations,” Col Elliott said. 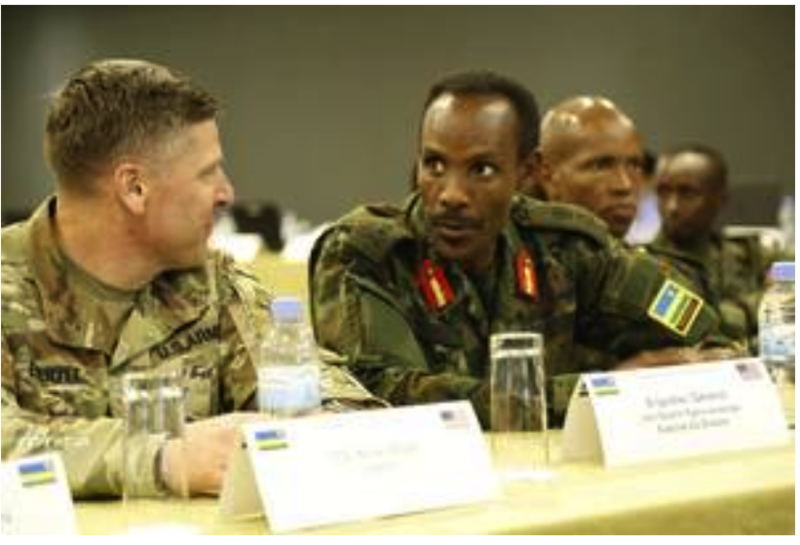 This is the second time military planners meet in Rwanda to design this year’s exercise; they first met in mid-February for the Initial Planning Event (IPE), and will again meet in June for the Final Planning Event (FPE). More than 1200 military, police and civilians are expected to participate in this year’s exercise, these include; Military and Police representatives from Botswana, Cameroon, Cote d’Ivoire, DR Congo, Egypt, The Gambia, Ghana, Guinea, Kenya, Madagascar, Mali, Morocco, Nigeria, Rwanda, Senegal, Tanzania, Tunisia, USA and Zambia who have already confirmed their attendance. RDF hosted the Command Post Exercise (CPX) Shared Accord 2018 (SA18) last August at the Rwanda Military Academy in Gako. Rwanda is the third largest troop contributing countries of peacekeepers, and one of the first to deploy peacekeepers to the Central African Republic in 2014.